Well, here you go, social media explained in one easy graphic from http://www.themetapicture.com. At least that seems to be where it came from. Does anyone understand the use of online content (graphics, videos, articles, etc.) that are floating around the internet? When can we use them? How can we use them? There must be copyright laws that apply. I did some investigating on this subject; however, rules and regulations were not clear. I’m sure this has crossed ALL of your minds when you are passing along a post, a graphic, a video, an article, etc. How does an author “own” their own content. This is a big question, because social media is about “sharing.” I think rules/regulations are evolving on a “case by case” basis. Yes / No? I just read an article about cyber thieves stealing domain names from up and running companies. The company realizes this has happened when they are not receiving foot traffic or any orders. They think their site went down. They investigate and find their site was stolen. Lots of legal work to get their site back! One thing I have noticed is that some authors have started putting their name / website address on their graphics. Like this one I am sharing with you. This way, we all know where the content came from. Excellent idea! Back to this social media graphic. Great, right! 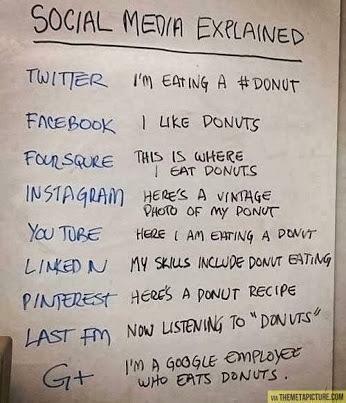 What a concise way to explain marketing using social media. It looks like the graphic came from a Google marketing meeting. When put in layman’s terms suddenly social media is easy and understandable. So, if you are good at social media, the sky is the limit on how you can market yourself and your company. Where do Blogs fit in on that white board though! Great Moni!!! This is fabulous!!! You write so well!